Yellow International from TST Expedited. Rene Buron and I have both been watching for this one for a while. I've seen it several times but today was the first time I could get a picture. Re: Yellow International from TST Expedited. Finally you got it Rob,Bravo! Before seing the truck with a good angle I was guessing for an ex-Penske truck but now I am not sure at all,what you think about that?I am dubius about another think.This truck with no bunk looks like a local or regional cruiser but I see it a couple of time in the Quebec Eastern Townships.I hope for the guy he has good deals for its Motels. With that window in the body he may have a bunk in there. There seem to be more than just this one, gentlemen. Yesterday afternoon as I was westbound on Hwy. 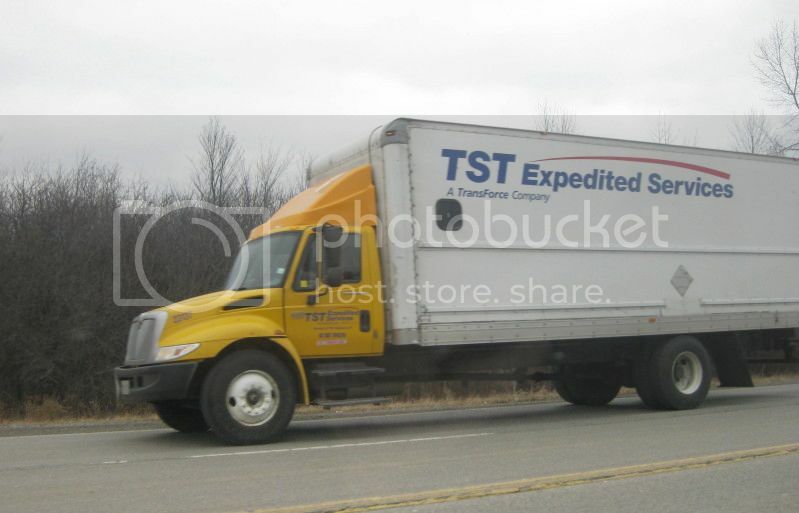 401 between London and West Lorne, this truck or one similar to it was heading east along the 401. As I aproached the bottom of the Ambassador Bridge in Windsor, another one identical to these 2 came off of the bridge from the Detroit side. True. Every now and then you see an expediter truck with a homemade sleeper built into the box. I don't know if it is DOT legal but it has been done.